SINGAPORE - 10 July, 2008 - Creative Technology Ltd., a worldwide leader in digital entertainment, today announced the Creative ZEN® X-Fi® and Creative ZEN X-Fi with Wireless LAN digital media players for music, video and photos - the only players to feature award-winning Xtreme Fidelity™ X-Fi audio technology. 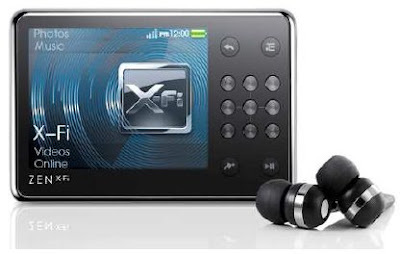 "We're very excited to achieve this breakthrough of adding our X-Fi audio technology to a ZEN player, setting the highest standard in audio quality for portable music players," said Craig McHugh, President and COO of Creative. "Some of the top recording artists in the music industry are very outspoken about the poor quality of digital music. We addressed the issue of the poor quality of digital music by inventing X-Fi technology, which restores the quality of music that is lost during the digital ripping process, and now for the first time ever we've been able to implement this technology in a ZEN." "We also give you the freedom and flexibility of being able to listen to music, watch videos and view photos on your Creative ZEN X-Fi with Wireless LAN that are stored on your PC," continued McHugh. "You can also wirelessly add your favourite music, videos and photos to your player from your PC, so you'll always have them with you wherever you go." The Creative ZEN X-Fi with Wireless LAN is available today in a 32GB model for S$399.00 and a 16GB model for S$329.00. The Creative ZEN X-Fi 8GB model which does not include the Wireless LAN function will be available later this month for S$229.00. The Creative TravelSound ZEN X-Fi Docking Speaker System will be available end September for S$79.00.